3. Slice carrots into 1/2 inch thick rounds , toss with the olive oil, chili powder, sea salt. 4. Roast carrots for about 15 - 20 minutes in the oven, until a bit crispy. 5. Steep saffron in the boiling water for a few minutes. Let cool and mix with the yogurt, along with sea salt. 6. Now fry the socca batter with some olive oil like you would pancakes. In batches. Until edges are a bit crispy. A cast iron skillet is good if you have one. Cover to keep warm. Socca can be thick or thin, as you prefer. You can refrigerate your leftover socca, slice it into sticks the next day, brush it with oil, and roast it in a 450 degree oven to make "socca french fries." Try adding grated carrots, finely chopped garlic, finely diced onions, or grated zucchini into the socca batter before cooking it. 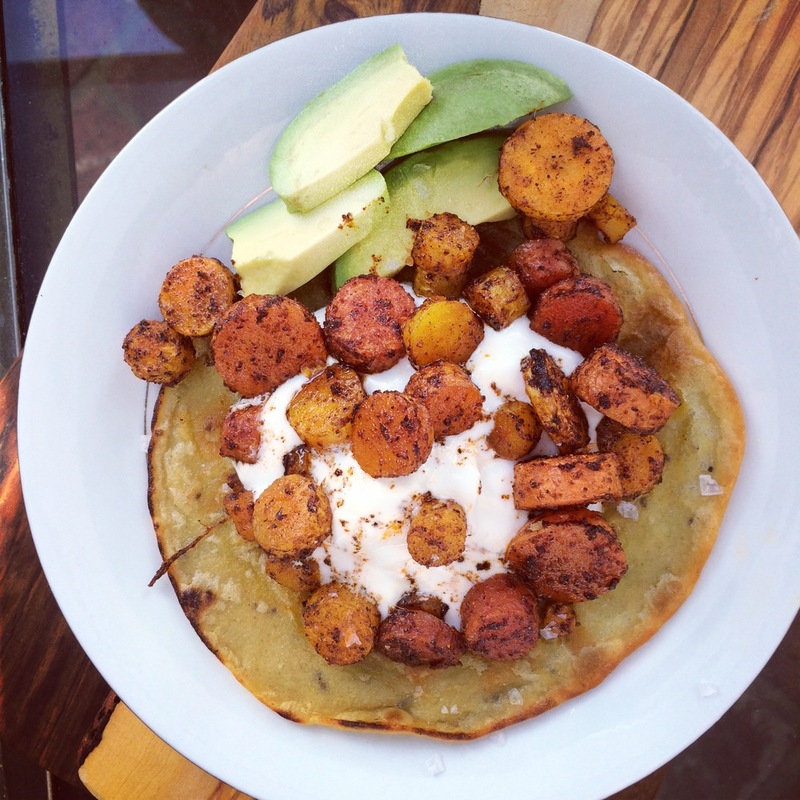 You can even wash the green carrot tops, chop them up, and mix them into the socca batter. « Shorbat Addas – Vegan Lentil Soup with Vermicelli Noodles & Lots of Lemon!